Imagine a world where we could easily pinpoint the exact causes of complex diseases such as cancer, heart disease, and diabetes, allowing us to determine the proper treatment faster and with more accuracy. Genomics is taking us one step closer to this future. Transformed by the success of the Human Genome Project in 2003, genomics is an emerging, innovative field that aims to understand how organisms’ complete DNA sets work in relation to the environment around them. Read more to learn all about genomics, how it relates to genetics, and how the field can change the way we approach the treatment of complex diseases. A genome refers to the entirety of a living organism’s DNA sets. Genomics seeks to understand the makeup of the DNA code and how it can be harnessed to solve real-world challenges. Genomics and genetics are closely related. While genomics looks at the entirety of an organism’s genes, genetics studies DNA closely and how the code it carries affects organisms’ traits. Genetics can help explain why some people inherit diseases like Cystic Fibrosis or Huntington’s Disease. Genomics looks at more complex diseases such as cancer, diabetes or heart disease, which are caused by a combination of genetic, environmental, and lifestyle factors. 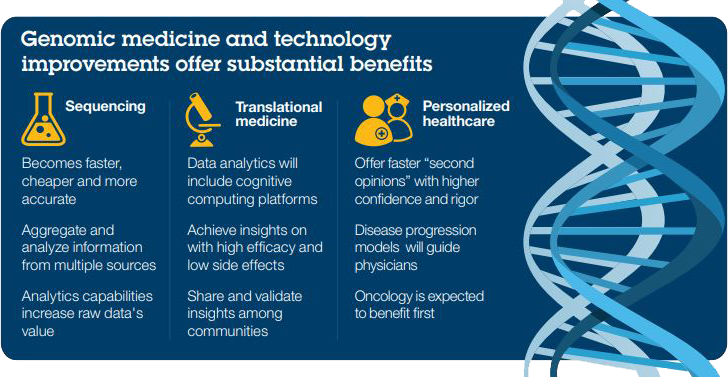 How will genomics impact the world? Genomics can pave the way for the development of new treatments and help with early detection of life-threatening diseases and help us understand why certain people are more prone to specific diseases. Genomics has helped to identify a particular genetic mutation responsible for about 4% of Cystic Fibrosis cases, leading to the development of a drug that has proven effective in treating individuals with this mutation. The field of pharmacogenomics uses a person’s genome to determine whether or not a specific therapy will work for them. With help from genomics, researchers are developing a non-invasive test that would help determine early on if a heart transplant recipient’s body is rejecting the donor organ. Genomics also helps study illnesses caused by E-coli contaminations as well as infectious disease outbreaks such as the Ebola virus. Are you captivated by innovative and disruptive technologies and how they will affect our future? Investors looking to diversify their portfolio can capitalize on a promising sector like genomics and play a key role in financing the next wave of technological advancement. The Evolve Innovation Index ETF (EDGE) provides investors with exposure to a number of key players advancing the field of genomics.